If you haven’t already seen House of Cards, the US political thriller TV series starring the late great Kevin Spacey, then get out the Battenberg, plug in those Bose headphones and get watching. And yes, I know that the great Kevin Spacey isn’t technically “late” in that he’s still alive, but the phrase “late great” has such a ring to it. The US edition first aired in 2013, ran for two seasons, and a third is currently being filmed. It’s not, as you might suspect, about Clintons the famous High Street card shop, nor about magicians doing sleight of hand but rather about shady deals, backstabbing, suspect practices and plain criminal activity in American politics. It’s centred on the White House and Congress, and concentrates on Spacey’s character Francis Underwood’s struggle to climb the greasy pole. The West Wing notably features some great insights into the sorts of shenanigans and compromises you need to get involved in to be successful in politics, but House of Cards is much grittier and more realistic – though still not, one suspects, anywhere near as bad as the real thing. After all you just expect US politicians to be liars, cheats, swindlers and all-round baddies, so there’s no believability gap there and you can get involved and enjoy it right from the start (or the get-go as they say over there, for reasons that escape me). The original House of Cards TV show, based on a book by Michael Dobbs, was actually British and aired in the early 1990s, starring the immortal Ian Richardson who died in 2007. Francis Urquhart, his character equivalent to Spacey’s Francis Underwood, brilliantly portrayed similar underhand, bad and downright criminal behaviour in his own climb to power, and that original series is highly enjoyable and well acted. But even though you know deep down that our own politicians are just as deceitful, egotistical, ruthlessly ambitious, shameless and corrupt as any to be found in the world, somehow the image of the corrupt politician just strikes a chord in one’s vision of the USA. You just expect American politicians to be on the take and so the US version with Spacey seems that bit more satisfying and true. It really is a brilliant show, in fact so good that I’d watch it even if there were no battenberg to hand – I’d go so far as to say that I’d even watch it while eating a Victoria sponge – you can’t get much plainer than that, can you, and you all know how much I love cake. 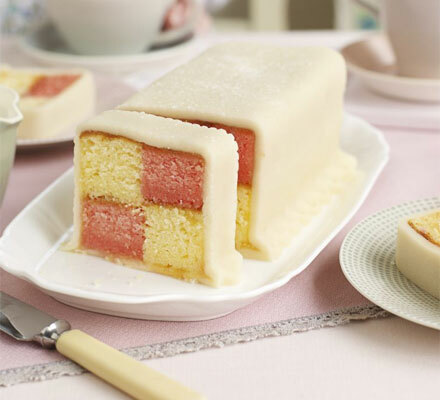 And speaking of cakes, it’s interesting that the regal battenberg cake didn’t have its name changed when the royal family started changing theirs. The Queen and her lot are really from the house of Saxe Coburg-Gotha thanks to good old Prince Albert who married Queen Victoria, but George V thought it a good idea to change the family name just before the country went to war with Germany so he wouldn’t be mistaken for one of the enemy. He chose Windsor as a good old English name for them, and Windsor they’ve been ever since. Yorkshire Pudding would have been more convincing, or even Smith, but there you go. So anyway, Battenberg, another old German dynasty named after a village in Prussia (“berg” in the name means mountain) is tied in with the Saxe Coburg-Gothas, and Lord Louis Mountbatten, close relative of the Queen, also thought it a good idea to drop the title of His Serene Highness Prince Louis of Battenberg and rename himself Mountbatten so it wouldn’t seem odd his sending our ships in to bat against the Germans. So the cake could just as easily have come over too but didn’t. That’s why this wonderful confection, sumptuously clothed in marzipan, is rightfully called the Cake of Kings, or the King of Cakes, and certainly one of my favourites to accompany US political thrillers. 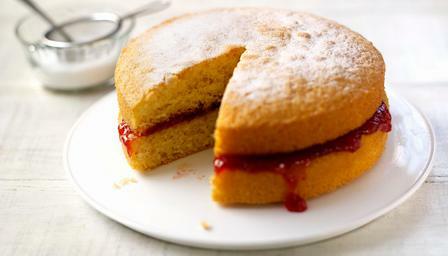 I recommend House of Cards and I recommend battenberg cake – they make a fine pair.